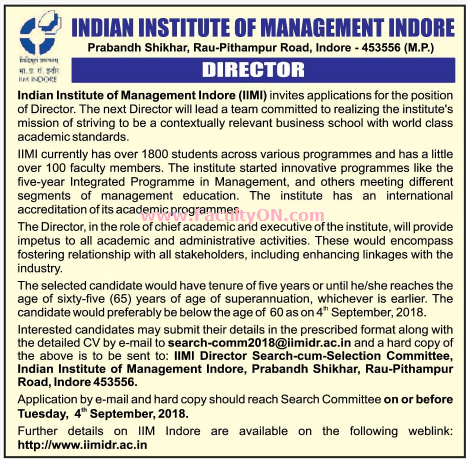 Indian Institute Management, Indore has advertised in THE TELEGRAPH newspaper for recruitment of Director jobs vacancies. Interested and eligible job aspirants are requested to apply on or before 04th September 2018. Check out further more details below. About College: The Indian Institute of Management Indore is an autonomous public business school located in Indore, Madhya Pradesh in India. Instituted in 1996, IIM Indore is the sixth addition to the Indian Institute of Management family of management schools. How to Apply: Interested and eligible candidates are requested to send application in prescribed format along with all copies of certificates / testimonials and recent PP size photos to the email address as well as postal address provided here. Indore- 453556, MP State, India.